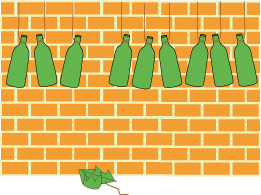 If the first bottle fell at ten past five in the morning ($5.10$ a.m.) and the others fell down at $5$ minute intervals, what would the time be when the last bottle fell down? Mass and weight. Speed and acceleration. Length/distance. Working systematically. Time. Visualising. Clock. Addition & subtraction. Temperature. Angles - points, lines and parallel lines.